Lightbulb Terminology - What does it all mean? The part of the lightbulb which secures it to the socket of a light fixture. The most common types are Edison Screw (E27) and Bayonet Cap (B22d). If you're not sure which type you need then try our cap fitting guide. This can be used to describe either the finish of the glass on the bulb, clear, frosted, or pearl, or it can describe the colour appearance (colour temperature) from a bulb. For example, a warm white has a yellow, orange shade and is used to create a cosy appearance. You would often see warm white lighting used in a restaurant. Cool white conversely has a blue tinge that gives a clear sharp appearance and would be used in offices or hospitals. Learn more about lamp types and their colour temperatures. Colour Rendering Index: This shows the quality of light. It is measured on a scale of 1-100 Ra. A CRI of 1 is very poor (monochromatic light) and 100 is perfect light (as we see when we are outside with no artificial light). For example, have you ever bought an item of clothing in a shop and found that when looking at it outside the shop the colours are different to how it appeared inside the shop? This is because the artificial light source in the shop doesn’t have as good an Ra value as natural sunlight so the appearance is different. Learn more about the CRI of different lamps. There are two ways to measure the amount of light emitted from a bulb. The first is Luminous Flux measured in Lumens (lm) this shows the total amount of light that is emitted by the source. We need to consider the light output when choosing amore energy efficient replacement bulb. The second measurement is Luminous Intensity measured in Candela’s, this measures the amount of light given off in a particular direction. One Candela is equivalent to the amount of light that would be emitted from a single candle. As lightbulbs don’t all fail at exactly the same time we classify the life of the lamp based on an average figure of 50% failure. So if you have 100 lightbulbs that have been rated at 1,000 hours life you can expect after 1000 hours to still have 50 lamps still working. 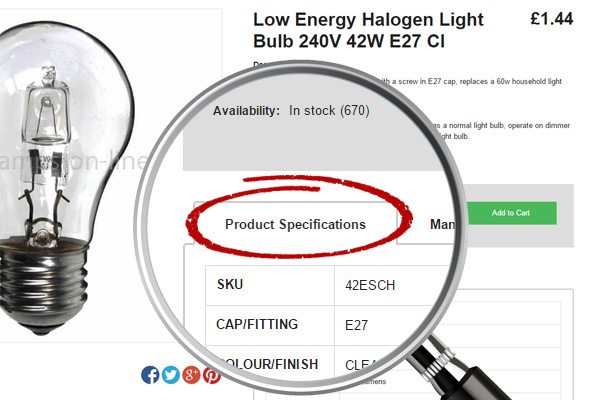 Our product catalogue contains bulbs in a wide range of voltages. The correct voltage will depend on the bulbs application but here in the UK our mains electricity is supplied at 240V. Lightbulbs are rated in Watts to show how much electricity they will use. A common misconception is to think a higher wattage means a brighter light. As lamps are becoming more efficient, the amount of watts they use is going down but not at the expense of the light output. This can be demonstrated with LED lamps, for example our 4.3w LED GU10 lamp gives the same light output as a 50w Halogen equivalent. This is our product identification number and is likely to be different from the manufacturer’s own part number.